Chief of German Nationalbank Weidmann postulated an increase of wages of averaged 3%. The Nationalbank normally is ordered not to intervene into negotiations of industrie and unions. With this postulate Mr Weidmann could loose his countenance. In EU there is a long term small deflation and with an increase of the wages a small long term inflation, which economy needs, is possible. The money people earn could starting the domestic market. The starting domestic market could lead to more GDP-growth and that could take an QE similiar effect. The more money circulates the better the economy growths. The GDP-growth in Germany in 2013 was 0,4%. If it decrease more Germany would be recessive. 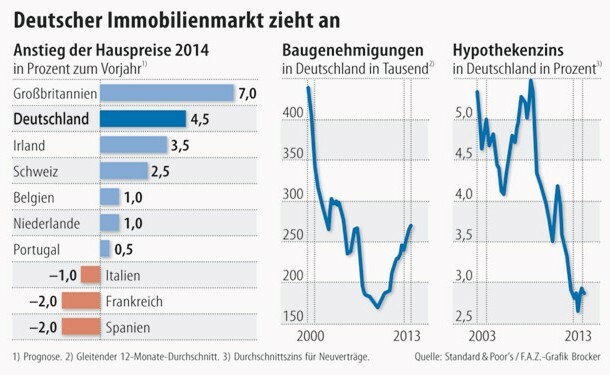 The consumerprices in Germany are increased by 1,2% yty. Furthermore the sanctions could lead to decreasing orders from Russia. Today the German government forbid the corporation Rheinmetall the delivery of a trainingscamp to Russia. 30000 Soldiers should be trained there per year. Other military orders should follow. Russia will turn away from europe and look to China. Some european countries, also Germany have good relationships with Russia. The sanctions will have negative impacts on the economies of european countries. Sanctions to Russia could be a destabilising factor for europe, an instrument of calculated pressure for USA to Europe. China has already 46 long terrm treaties with Russia. Chinas orders are decreased in first quarter of 2014 by 15% to 17%. China will be glad, USA will furthermore sanction Russia, so more orders will come to the country. As Russia administer ban on US and german agriculture products, Brazil will take advantage of this measure. Russia ban target cheese, fish, beef, pork, fruit, vegetables and dairy products. Russia may also impose measures on the aerospace, shipbuilding and auto industries in the future. The ban target nations that sanctioned or supported punitive measures against Russia, including Canada, Australia and Norway. German agricultur companies export 2,5% of it’s output to Russia. The U.S.-EU relationship is with nearly half of global GDP the largest in the world. We trade about $1 trillion in goods and services each year and invest nearly $4 trillion in each other’s economies. That all supports around 13 million jobs on both sides of the Atlantic. The TTP would deepen those ties and decrease barriers to trade and investments. The labor market will change. Innovation will destroy many jobs but in lower income labour market the people will be needed. Especially in Service Sector people will find work again. US president Barack Obama was in Lattvia End of April discussing the situation in Ukraine, the security of energy supply, and the deployment of U.S. Army Europe’s 173rd Infantry Brigade Combat Team to conduct exercises in Latvia. That shows that the TTIP punctuate the US-EU in economic and military cooperation. It is also a strategic manifestation of partnership. The goals of TTIP include expanding access to each other’s markets for goods, services, investment, and procurement; increasing regulatory compatibility while maintaining the high levels of health, safety, labour and environmental protection our citizens expect of us; and formulating joint approaches to rules that address global trade challenges of common concern. A high-standard TTIP agreement will make us more competitive globally, and boost economic and jobs growth, including for small and medium-sized enterprises. But there are Americans who say that we should make international trade, but only if it make economic sense. And there are NGO’s who say that the TTIP undermines the independence of the parlaments of the memberstates. That the TTIP would forebid memberstates to make laws, which decreases the profit of international corporates. The memberstates of TTIP could be charged by the global acting corporates and have to pay compensation for their lost profit. If a TTIP memberstates declare a importstop to gen manipilated seeds the corporates could charge the state. That would cancel the principle of democracy and the independence of the parlamentarians. It would lead to a global dictatorship of global acting corporates. There are only sparly informations about the negotiations of the TTIP. If it is like the critics say we should rethink the agreement, to proof if it is really necessary to throw away our government fundamentals, like democracy and freedom for the favor of economics. There were many wars, unrests and revolutions in the last years because of democracy and freedom. The new states gave us a model role. They would fall into a vacuum if we forgot our moralities.